Official TeamViewer pricing as of February, 2018. When CareTech was just beginning and our office was a corner of our living room (yes, my dear wife patiently put up with that mess, bless her! ), I started using TeamViewer for our remote support needs. Our business budget was small, and I started out with the free version. I chose TeamViewer simply because I was familiar with it (who isn’t? ), and it works well. This arrangement worked for a time, but then the TeamViewer software on my computer figured out that I was spending considerable time controlling quite a number of unique client computers… and began throwing up warnings that I was using it for commercial use and would have to pay to keep using it. This is to be expected, because the personal version is not to be used commercially; and it was inevitable that we’d have to purchase a commercial license eventually. So I bought a license for TeamViewer 10, with a free upgrade to the upcoming TeamViewer 11, which was to be released within about a month. The cheapest license, which as I recall was in the neighbourhood of $650 or so, wouldn’t work for me because that only would have allowed me to install on just one of my computers; because of the way I worked, and the fact that I worked at home part-time and in another office (book-keeping job) part time, I had to be able to support customers from any computer I happened to be in front of. So I jumped in and (somewhat unwillingly) paid TeamViewer about $1,300.00 CAD. As promised, we got the TeamViewer 11 upgrade for free and all was well. About a year later, TeamViewer 12 came out and I started getting “special upgrade offers” in my inbox. For “just $639,” as I recall, I could upgrade my commercial license to version 12! Well, I still wasn’t quite over the sticker shock of what I’d paid them about a year prior, and refused to bite. For some time this still worked fairly well, because many of my clients still had version 11. But the TeamViewer software has a sly way of popping up a banner notifying users that a new version is available, and the upgrade process is easy… so of course, as time went on more and more clients no longer used version 11. Note that the way TeamViewer is set up, a host can control a client running any version of software equal to or less than the version of the host. In other words, if I’m running version 11, I can control anyone running any version of TeamViewer up to version 11 but no newer than that. I can control client computers running 11, 10, 9, 8… and so on. But with version 11, as host I can not control clients running version 12 (and now, 13). The “solution” is to keep upgrading. But it didn’t take me long to decide I simply was not going to pay $650 every year for the privilege of keeping my license up to date. So, the search for alternatives began in earnest. Self-hosted. I am not a fan of the way so many services are moving to the cloud. The cloud has its place, to be sure; but in my opinion the race to the cloud is getting completely out of hand. I wanted to run my remote support software on my own server. Ease of use. Many people I support remotely are not that computer-savvy, and having to lead them through a complicated connection process is frustrating — not to mention, time-wasting. And in the service business, time is money. Mobile support. Occasionally I need to remotely control Android phones. Samsung actually allows remote support software to control their Android devices. (As far as I know, they are unique in this respect; some other brands, including other flavors of Android and iOS, allow view-only access.) Sometimes it’s awfully handy to help a struggling mobile user by simply running his phone for him for a bit. Economically priced. Last but not least, the software had to be affordable for a one-man shop. Bonus point: it better work well, too! Does anyone meet all four (five) criteria? After spending hours searching, reading, pricing, eliminating options that were not self-hosted or that priced themselves clear out of reach, I finally settled on ISL Light. Bomgar and ConnectWise (formerly ScreenConnect) offer self-hosted options but both were priced well out of my range. I demoed Simple Help just a little and though it meets the self-hosted criteria, and certainly was priced right, I wasn’t sure if the connection process was quite as smooth and intuitive as it could be and wondered if my typical client would find it difficult to connect. (I’ve been thinking of re-visiting Simple Help, not as a replacement for ISL but as a fallback option. It’s handy to have a couple tricks up your sleeve when a client has trouble connecting.) Anyhow, as someone who self-hosts as many of his own services as possible I was happy to discover that ISL checked off most items of my wishlist. It can be self-hosted, and is cross-platform. It supports mobile devices, is easy to use, and self-hosted pricing is reasonable. It’s self-hosted and can be run on a Linux server. On that point, ’nuff said! There’s software installed on my computer, reminiscent of TeamViewer. 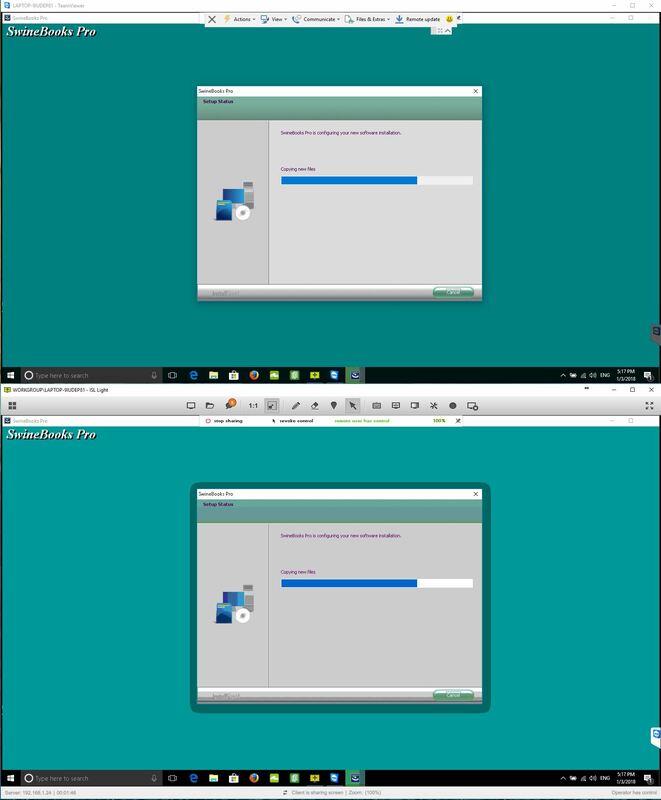 Some other options, like ConnectWise (formerly ScreenConnect) are entirely web-based; to initiate a support session, you must do so through the web interface, download the small client file and run it, etc. Personal taste here, but for this type of thing I’m in favor of non-web software that runs on my computer. 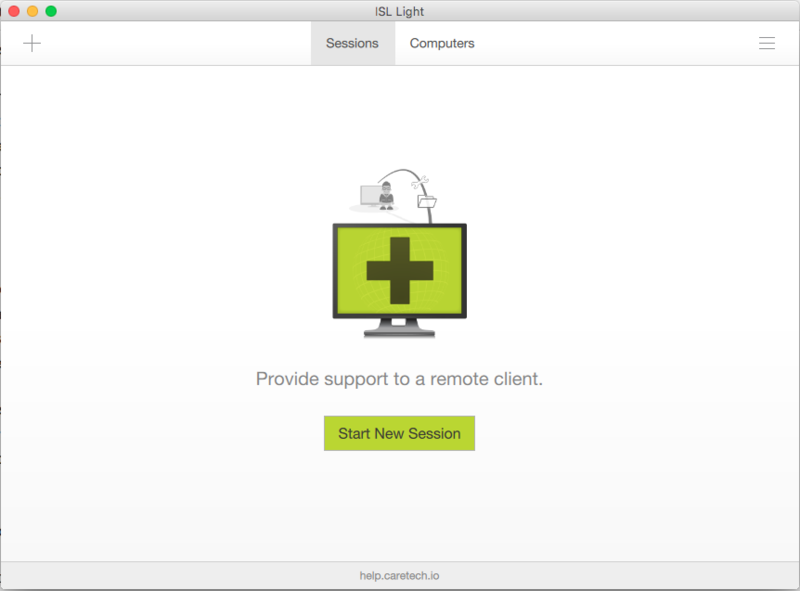 The ISL Light support software running on Mac. Clicking “Start New Session” opens a new window with a unique session code for the client. There’s “always on” client software that can be installed and allows you to connect to a computer any time, unattended. This is like adding computers to a TeamViewer account. Always On clients can be sorted into groups for better organization. Like TeamViewer, while connected to a client computer you have the option of instant messaging with the client, or initiating a voice or video call. You can also switch sides with your partner and show him your screen instead. Like TeamViewer, ISL is cross platform. I can support clients running Windows, Mac, or Linux; and I can do so from any computer I happen to be working on whether it’s Windows, Mac, or Linux. It can work with just one firewall port (TCP 7615) forwarded. Port 80 and 443 can be used if needed or desired, but it can work totally well with just one non-standard port. This can help free up incoming 80 and 443 for internal web servers. It’s re-brandable. With some effort, you can replace the default logos and branding with your own company logo. Even the executable files that are downloaded to client machines can be renamed. ISL Light controls mobile devices that support remote control. I don’t use this often but it is a nice touch that comes in handy once in a while. There’s an instant messaging / website chat feature included. I’ve not used this yet but for those of you who wish to have a “click here to chat with us” button on your website, that’s a bonus. Instead of signing up for a subscription-based website chat service, host your own! No extra fees for this. Updates are released fairly frequently, and updating to the latest version is painless through the web-based admin panel. ISL promises that they will never break compatibility through updates as TeamViewer does. An older server version is always supposed to be able to control a newer client without problems; so you’re not locked into a system of forced upgrades. The team at ISL has been eager to please and I’ve not had a hard time getting their dev team’s attention when I’ve discovered bugs. Charles, my rep at ISL, is just a phone call away. My emails to him and Alex have received timely responses. Finally, it’s relatively affordable. After some negotiation with a sales rep, who bravely took my offers to his manager, we agreed on a price less than what I had originally paid TeamViewer. This got me a perpetual license to run ISL Conference Proxy on my own server, with a year of software updates and support. This includes just one technician channel, just like TeamViewer Premium, although (also like TeamViewer) that one technician can control unlimited client computers simultaneously. Additional channels are needed if two or more support agents will be hosting sessions at the same time. 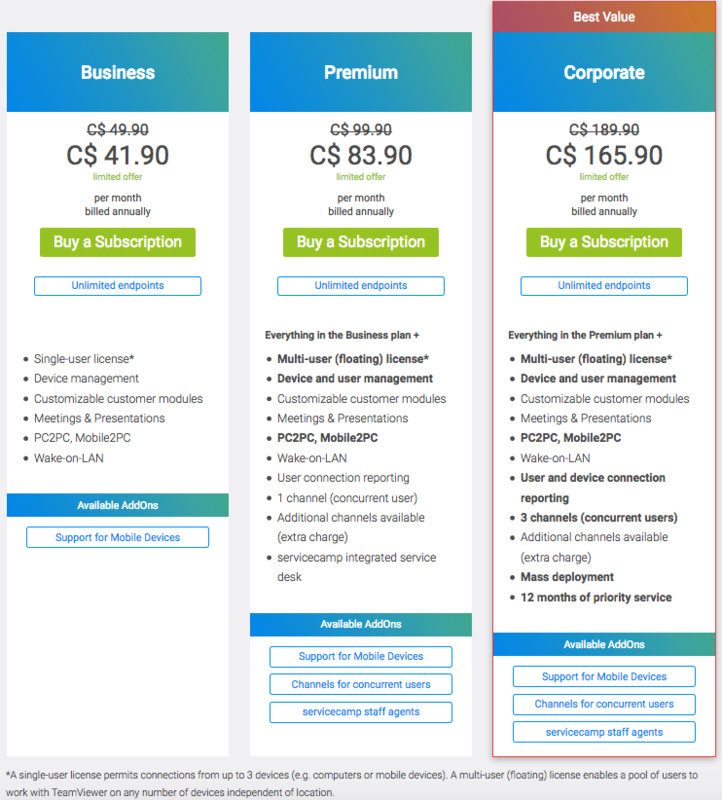 I forget what additional channel licenses cost, but the annual fee for self-hosted servers is just $139.00 and I only need to pay that if I feel like it. I do feel like it—I like software updates, I want to support what they’re doing, and I think good remote support software is worth that much to my business. Apparently the annual fee is $139 no matter how many concurrent licenses you have — a great savings for small businesses who are expanding and need to watch their budget. While we’re on the subject of cost, contrast that with TeamViewer’s new pricing. The Premium plan at the “special price” of $83.90 per month would cost us $1,006.80 annually. I’m not sure how long that special pricing is good or if it’s there to stay; presuming it’s not, at the regular price of $99.90 monthly, that amounts to $1,198.00 annually. And that’s for just one concurrent technician license. Adjusting the $139.00 USD for Canadian funds at an exchange rate of 1.30, I can pay ISL roughly $180 per year; that’s over $800 of savings to take to the bank. This screenshot shows two support sessions open to the same client computer; one with TV, one with ISL. TV’s view (top) exhibits somewhat better-quality graphics than ISL’s default (bottom). I’ve found that when a client is using a very poor internet connection, such as a “turbo stick” in an area of patchy cell service, ISL sometimes struggles to connect and stay connected. In a few rare instances, I was able to connect with TeamViewer but not with ISL. The connection in these cases was so sluggish that even though TeamViewer worked, the experience was an exercise in patience. Still, TeamViewer does take the honors here for a slightly more efficient data transfer protocol. TeamViewer also has the advantage of being widely known and the odds that a client will already have it installed on his computer are fairly good. However, the connection process with ISL is painless enough that directing clients to download the file and enter a session code is not an inconvenience. It’s also possible to email a session invitation directly from the host session. I have experienced a few occasional glitches with ISL. For example, just recently I connected to a computer and could view the remote screen but not exercise any control. I’ve only seen this behaviour once, so if it never happens again, I won’t worry about it. Nothing is perfect, and TeamViewer had its random quirks sometimes also. In conclusion, ISL Light has done a good job of ticking off my requirements check boxes at an affordable price. The team at ISL has been responsive to input. In my estimation, the cons are more than redeemed by the pricing, the frequent software updates, and the self-hosted option. If the pricing of your remote support software has you searching for alternatives, you might want to add ISL to your shortlist. Update: The original article didn’t include any links to ISL’s website. Visit them here; and information about self-hosting can be found here.